As we learned when we went looking for the top-earning Patreon artists, teaching art online can be a tremendously lucrative business. The great thing about the Internet is the wide variety of options you have if you want to share your art skills with the world and make a little money doing it- you aren’t restricted to a single platform. If you’re not using Patreon, you can use YouTube to give viewers a small taste of what you can teach them and make them hungry for more, then direct them either to your own website to purchase courses, or use a teaching marketplace like Udemy or Skillshare. 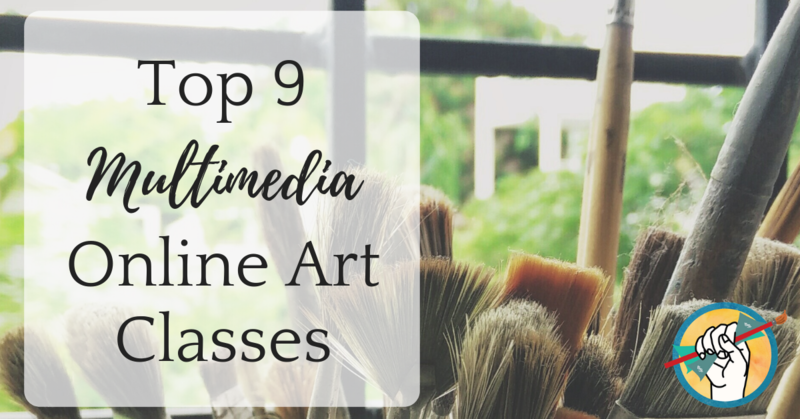 We’ve examined a small sampling of the top multimedia online art classes in three categories: artists teaching courses on their own website (often driving traffic from YouTube), artists teaching courses on Udemy, and artists teaching courses on Skillshare. Topic: This class is a combination of journaling and mixed-media art making. Structure: Three sections with a total of 17 high-def videos as well as downloadable materials. What Stands Out? Rather than filming the videos like a one-on-one course between the instructor and the viewer, these videos feature Kelly Rae giving the instructions to a guest student. Kelly Rae’s vibe is very authentic and open-hearted. She has positioned herself in the market to speak to people looking to express themselves with authenticity and a generic spirituality through her unique mixed-media techniques. Kelly Rae Roberts is a star example of a super well-defined, consistent, and memorable brand. Once you’ve seen her work, you’d recognize it anywhere- and she translates this very well to her courses. This course also provides lifetime access to a private Facebook group. This is an easy and free way to build and expand your brand and entice your potential students. Check out our interview with Kelly Rae Roberts here. Topic: Drawing the human body- there are courses in anatomy, figure drawing, portraiture, and caricature. Structure: Courses are typically broken down into individual lessons, which you can purchase as individuals or bundled together. Courses include videos, ebooks, downloadable lesson materials, access to virtual 3D models, and the opportunity to receive personal drawing critique from Stan Prokopenko. What Stands Out? Stan Prokopenko has a silly and somewhat gregarious personality, which he lets shine through in his videos. This endears him to his viewers and sets him apart from the drier art courses out there. There are a lot of resources available once you’ve purchased the course including ebooks and really cool 3D models. Stan also offers students the chance to be featured in professional critique videos. 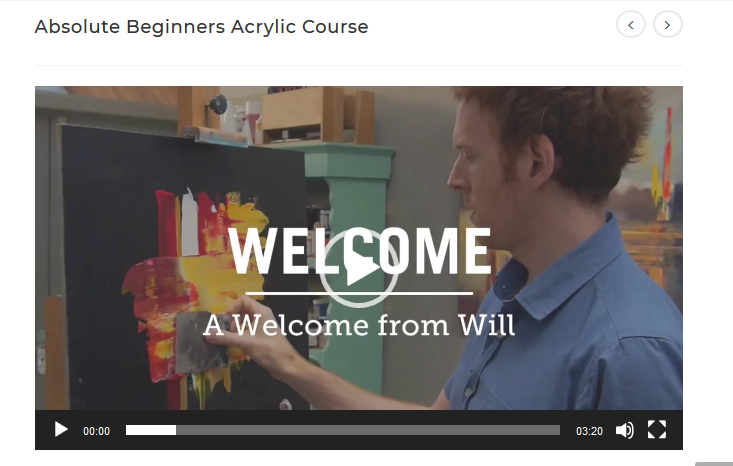 Topic: Acrylic painting for, as it states, absolute beginners who have never painted before. Structure: 7 video courses, 45 minutes and shorter, that teach the basics of working with acrylics as well as walk the student through creating three separate pieces including landscapes and a still life. What Stands Out? This class is very specifically targeted at those who desire to paint but feel intimidated by getting started and lack both time and confidence to jump the initial hurdle of learning how. The videos are intentionally short for busy people pressed for time, and the course is kept simple. At a lower price point than some other online art courses, the only supplemental materials are reference images. Will has positioned himself as an artist and teacher who is bringing professional art “secrets” to the layperson who has perhaps never touched a paintbrush before, all in a friendly and approachable way. Topic: This course breaks the science of drawing down to the fundamentals as a resource for complete beginners, as well as a strong drawing foundation for artists. The selling point is to start the course as an absolute beginner and finish with advanced drawing skills. Structure: 11 sections each with short video lectures on drawing fundamentals including shape and form, values and contrast, space and perspective, figure drawing, and more. What Stands Out? This course has a very comprehensive curriculum including a large Getting Started section with helpful links, tips for using the course successfully, a breakdown and explanation of the required materials, and the chance to join a Facebook community. For the price, the course offers massive value, and students on Udemy have taken notice- this course has been purchased by over 200k people! This course also offers a money-back guarantee. Topic: This is another course on the fundamentals of drawing. Structure: 28 HD videos with 26 accompanying downloadable ebooks. What Stands Out? The large amount of supplemental downloadable material add a lot of value to this course. Sometimes it isn’t possible to sit down and watch a video, and the supplemental materials provide similar step-by-step instruction with images and illustrations. The instructor of this course, Matthew Fussell, also sells his courses through his website, The Virtual Instructor. Topic: This course is created to help beginner artists master the necessary brushstrokes for oil, acrylic, and watercolor painting. Structure: 7 sections each with a high number of short video lectures and supplemental exercises and questions. Two bonus sections are included with extra videos on the history of brushstrokes and using quality materials. What Stands Out? Jill Poyerd’s course features a high number of downloadable resources and assignments. Each section is broken down into very small manageable chunks so the course can be completed a little bit at a time. Structure: 11 short videos, all 6 minutes or shorter. What Stands Out? This class includes access to projects produced by other students who have taken the course. This is a really helpful way to visualize and generalize the concepts taught in the course. This course is concise and to the point. There is something to be said for focusing in on a very specific topic (or problem) and creating a course around it. This isn’t a course on graphic design or even on logo design- it’s a course specifically on using the Golden Ratio for logo design. There’s a very clear end goal- understand how to create a logo of just about anything using a particular professional gridding method. Topic: This course teaches the basics of DSLR photography. Structure: 9 short video lessons under 15 minutes, with an extra bonus video at the end. What Stands Out? The videos are brief and aimed at beginner and intermediate photographers looking to understand more about their DSLR camera. With Skillshare, you have the ability to view projects produced by other students who have taken the course. You can also view comments and questions left by previous students, which are often responded to by the course creator. What Stands Out? This class is focused on solving a particular problem- creating a digital copy of traditional artwork that can then be sold as a print. This course features a downloadable digital guide to the course material as well as a free high-res watercolor texture for use in Photoshop. 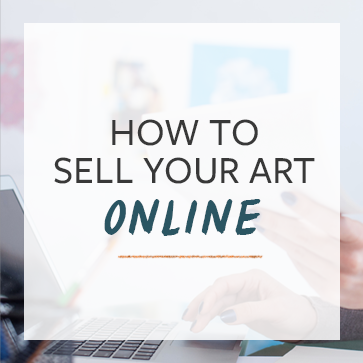 This course is quick and aimed at artists who are looking to sell their art online. The creator of the course is one of Society6’s top sellers, so the course is designed to entice artists who are interested in passive income through selling prints in online martketplaces. What Can You Learn From These Courses? If you have something to teach, there is somebody out there who wants to learn it. Short courses focused on a very specific skill or solving a specific problem do well. Not unlike selling prints, creating an online course is a lot of up-front work. But with the right marketing it can result in years of passive income for you. There are hundreds if not thousands of professional artists successfully supplementing their income by teaching art online. Online art teachers come from all walks of life, some with a professional degree and some who are self-taught and passionate. There are so many different ways to teach art online! Whether you want to use a marketplace platform like Udemy or Skillshare, or you’re willing to put in the work to selling the coursers directly on your website, there are tons of ways to start sharing your knowledge online- and make a profit doing it. Have you ever taken an online art course? Would you ever consider creating one yourself? Let us know in the comments! Yes, ive taken several online courses and have considered teaching online. I’ve taken multiple online courses from Flora Bowley and others. I would like to teach online in the future. I might need help with the tech part of it. Teachable seems like another good platform. Yes, I have taken courses online, and yes, I would consider creating one myself. I really considering this option but I struggle with the fact of making videos and put my horrible voice and bad english pronunciation.